TMJ stands for Temporo mandibular Joint, which is the name for each joint (right and left) that connects your jaw to your skull. TMJ (temporo mandibular joint) disorders are a family of problems related to your complex jaw joint. Since some types of TMJ problems can lead to more serious conditions, early detection and treatment are important. If your have had symptoms like pain or a "clicking" sound, these problems are more easily diagnosed and treated that they were in the past. These symptoms occur when the joints of the jaw and the chewing muscles (muscles of mastication) do not work together correctly. Damaged jaw joint due to injury or disease. Injuries and arthritis can damage the joint directly or stretch or tear the muscle ligaments. As a result, the disk, which is made of cartilage and functions as the "cushion" for the jaw joint, can slip out of position. Whatever the cause, the results may include a misaligned bite, pain, clicking or grating noise when you open your mouth or trouble opening your mouth wide. The more times you answered "yes", the more likely it is that your have a TMJ disorder. 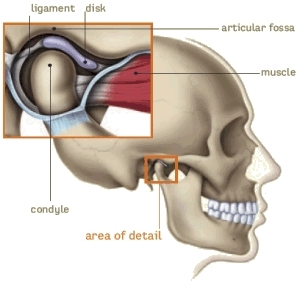 Understanding TMJ disorders will also help you understand how they are treated. There are various treatment options that we utilize to improve the harmony and function of your jaw. Once an evaluation confirms a diagnosis of TMJ disorder, we determine the proper course of treatment. It is important to note that treatment always works best with a team approach of self-care joined with professional care. Stress management techniques such as biofeedback or physical therapy may also be recommended, as well as a temporary, clear plastic appliance known as a splint. A splint or night guard fits over your top or bottom teeth and helps keep your teeth apart, thereby relaxing the muscles and reducing pain. There are different types of appliances used for different purposes. A night guard helps you stop clenching or grinding your teeth and reduces muscle tension at night and helps to protect the cartilage and joint surfaces. Appliances also help to protect from tooth wear. Surgery is generally reserved for patients with severe locking symptoms and/or pain not responding to conservative, medical treatments. Procedures may range from arthrocentesis (rising joint) to open-joint surgery. One of the most successful, yet conservative TMJ surgical procedures is called Modified Condylotomy. It helps reduce pain and locking symptoms by creating an increase in the space within the joint. It does not involve an incision on the face, thus reducing scarring both of the skin and inside the joint.